For those of us who sniffled our way through a teary goodbye to Woody, Buzz, Jessie, and the rest of the Toy Story gang at the end of the last movie, fear not: we'll still be able to keep up with their adventures through short films. 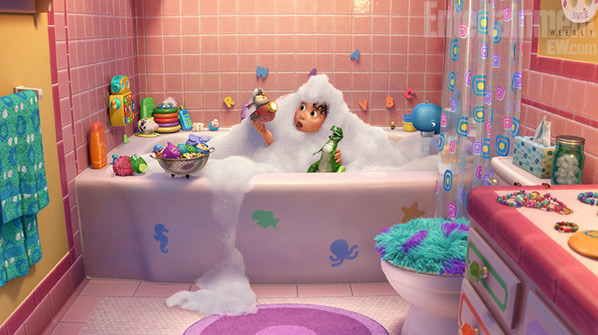 EW has a first look at Partysaurus Rex, the newest of these stories that will play in front of Finding Nemo 3D in theaters this September, and it stars our favorite worried dinosaur Rex as he lets loose when he heads to the bathtub for some playtime with his new owner, Bonnie. And it wouldn't be Pixar without a couple of easter egg references to their other movies. Check out two new first look photos below! It seems that Tom Hanks may have jumped the gun a bit with his announcement of Toy Story 4 back in June of last year, because we haven't heard a peep from Pixar about any sort of official sequel moving forward. Maybe Hanks was confused, or maybe he misunderstood the question, but in any case it seems clear that Pixar is planning on keeping these characters around through short films attached to other movies instead of giving them another full length adventure. For now, anyway. 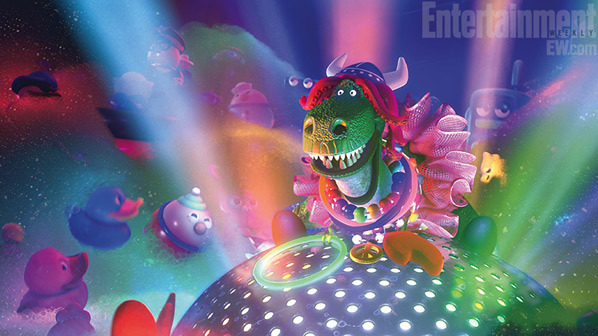 Regardless, it's good to see Rex getting some more love from Pixar, and Partysaurus Rex might be just enough of a reason to go check out Finding Nemo when it's re-released in 3D later this year. Thoughts? I am a fan of the Sully toilet seat cover.